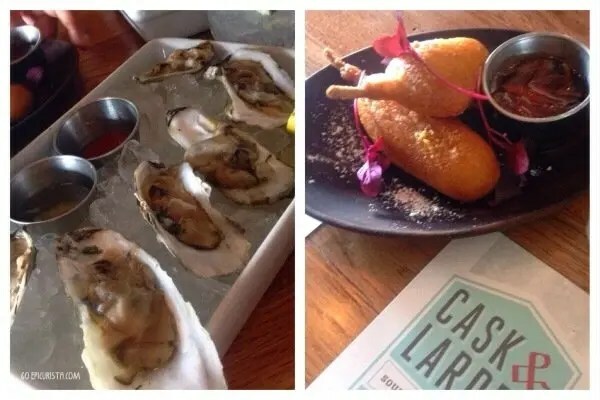 As I compiled my Top 9 List of Foodie Happy Hours in Orlando, I was reminded of a very special Happy Hour at Cask & Larder. As a way to cure the birthday blues earlier this year, I decided to hold 12 days of Birthday Celebrations. I know. It was a bit overzealous on my part, and no, this was not an alcohol-fueled revelry. My goal for those 12 days was to connect – and reconnect – with friends, share delicious bites, and celebrate life. The same life I am often reminded is too short and so precious. The life I was grateful to have one more year to add on to. The award-winning eatery from culinary power couple James and Julie Petrakis, with its good ole’ Southern charm, has been on foodie’s Must-Eat lists since it opened in 2012, and I had never been. Cask & Larder was on my “Someday List” and my mission at GO Epicurista is to #MakeSomedayHappen. How could I call myself a foodie in Orlando and never tried this restaurant everyone raves about? Well, I will tell you how. Working the “dark to dark” long days of the hospitality industry meant working right through those happiest of times, the ones that happen from 4p-6p, and most of the other ones too. I would constantly hear about these fun happy hours around town, and the next fleeting thought crossing my mind was “I will check it out someday”. 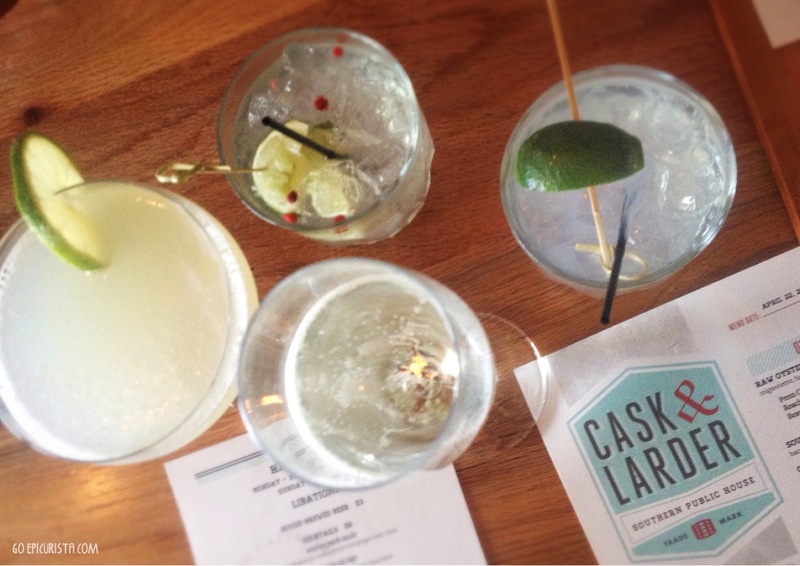 “On the 6th day of Birthday Celebrations my dear friends gave to me Happy Hour at Cask & Larder” – It sounds better when you sing it to the tune of The 12 Days of Christmas. The results were life changing, and quite possibly life saving. No, I am not an alcoholic but this was an intervention, sort of. You ask, how exactly did happy hour save my life? Let me tell you how. Somewhere between savory ham biscuit bites and Winter Park Mules made with local Winter Park genius vodka, magic happened. The kind of magic that stays with you. 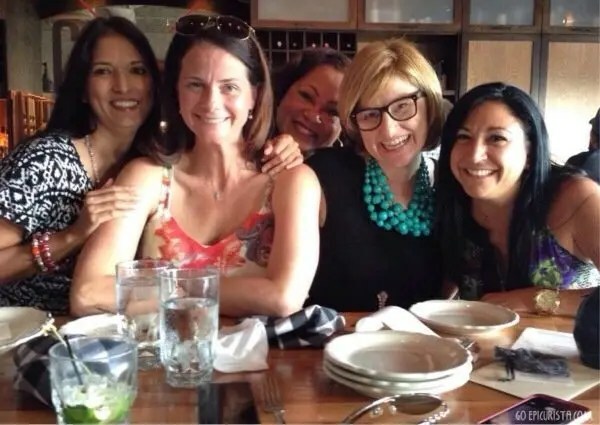 I realized that when you put off happy hour to “someday” you are actually postponing one of the most important of human connections, your friendships. You often hear true friends can go years without seeing each other and then pick up right where they left off. On this day, I celebrated my birthday by reconnecting with great friends I had not seen in over 12 years, and proved, without a doubt, the validity of that saying. Over fresh oysters with an amazing mignonette dressing, lobster corn dogs and glasses of Prosecco, we shared the stories of our lives. Rapid fire rounds around the table covering everything from jobs to love lives to families to loss to silly “remember whens”. Time stood still during those few happy hours. Powdered fried dough balls of goodness! Those Fried Dough (i.e. 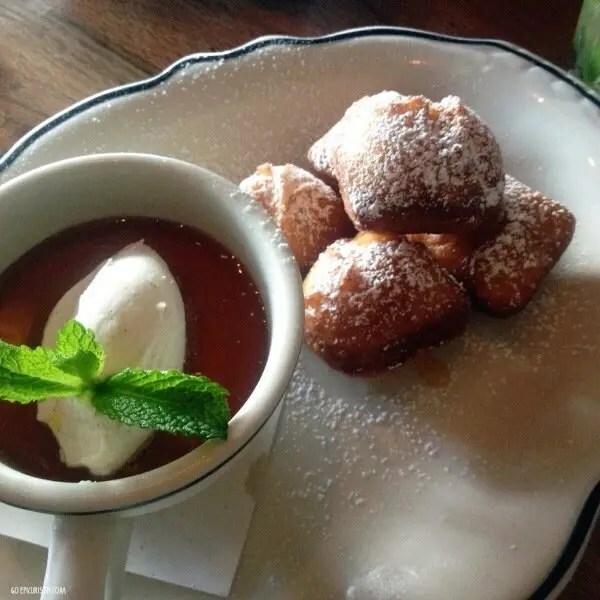 Beignetts) balls with soft caramel pudding and citrus caramel glaze and the perfect Ice Cream Sandwiches with chocolate shortbread, salted caramel semifreddo and peanut butter caramel were absolutely decadent and delicious. They made my birthday oh so sweet. Yet, the laughter and energy of our interaction fueled us more than the amazing food ever could. 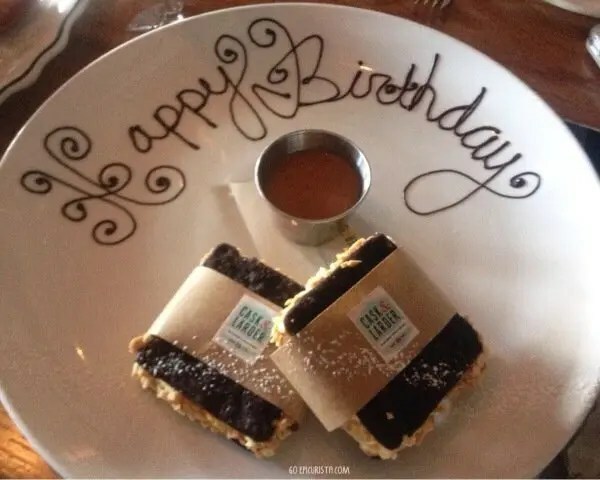 Ice Cream Sandwiches say Happy Birthday to Me! After that gathering, I was inspired and motivated. I was recharged. It was as if I had taken a vacation. It was in fact, an escape from the day to day. We all need that every once in a while in order to get back to our hectic lives and keep going. It was the type of “me-time” we all needed. This revelation changed and, quite possibly, saved my life. We may not see each other often. After all, every-day life, with busy work and family schedules does have a habit of getting in the way. But knowing it was done once, meant it can happen again. There is hope for us after all. It’s Happy Hour Fun with friends! We are now more proactive about it. We set a date in our calendars, usually months away when we can agree on a date where we are all in town and available, and we do everything we can to make it happen. Not everyone can make it every time we gather but we have made it a point to stay in touch. Facebook has in fact helped stay connected (proving it is in fact a “social” platform!). At the end of the day, that is better than any drink special. The next stop on our calendar will be sister restaurant, The Ravenous Pig. Cask & Larder was recently named by Esquire Magazine as one of the Best New Restaurants in America. I can see why. They make their own craft beer on-site and pretty much everything else, from cured meats, to canning their own preserves, to pickled vegetables. They are all about whole cookery and using local ingredients as their menu changes regularly based on what’s in season. 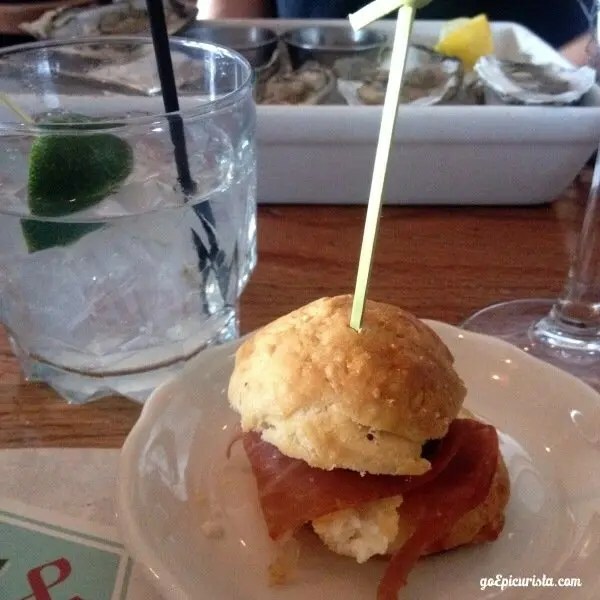 The current Happy Hour menu still features $2 fresh shucked oysters but no longer has those melt in your mouth ham biscuits. Featuring instead hushpuppies made with smoked fish dip, devil’s on horseback and a CBLT that sound quite fantastic. It’s not as extensive as other happy hour menus around town, but what it lacks in number of choices it makes up for in taste. Their goal is to get you to stay for dinner, which I plan to do next time. 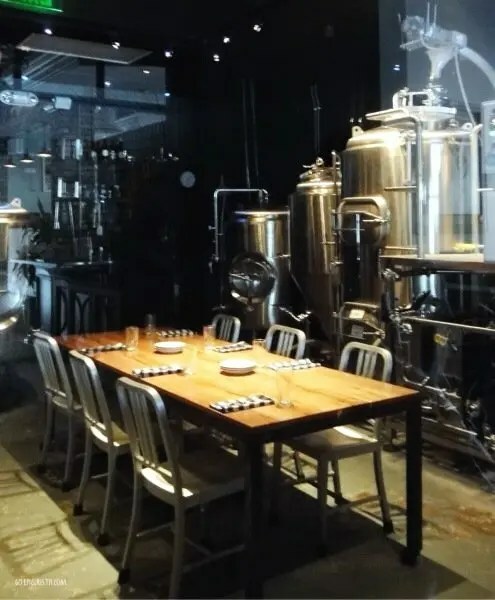 Ideally, in that awesome private room where beer is made! Cask & Larder is located on 565 West Fairbanks Ave, Winter Park, FL. To make reservations, click here or call 321-280-4200. Wouldn’t this be a fun spot for a friendly gathering? Have you ever said to your friends “let’s get together someday soon” and time goes by and you never do? Life is short. Don’t put off enjoying life with your friends to that elusive someday. 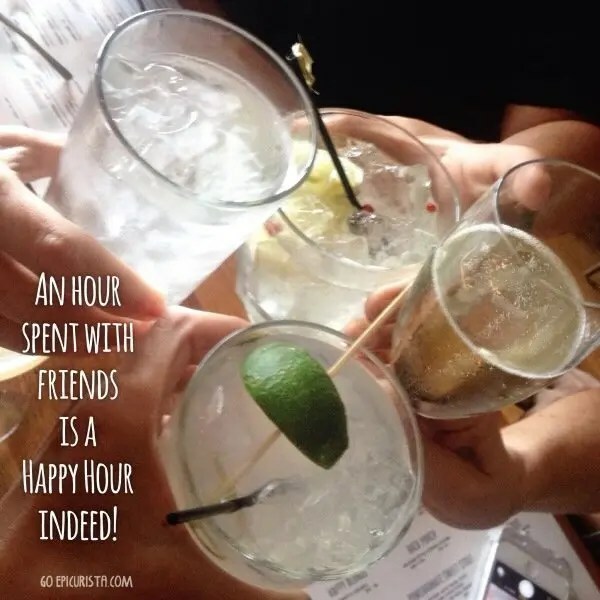 Taking the time to connect with friends over drinks and appetizers will always be a rewarding and recharging way to spend a few hours. Spur your own happy hour friendship revival by sharing this story with your friends using the social media links below. GO have a Happy Hour or two! It may just save your life.